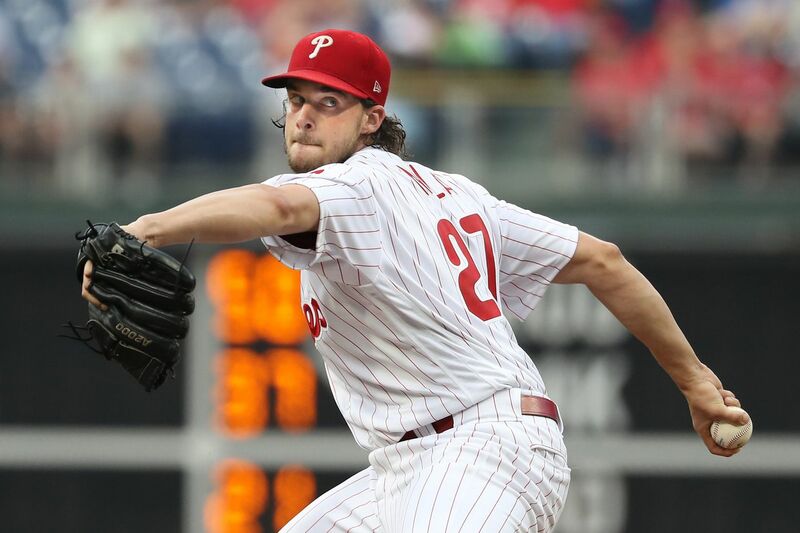 Aaron Nola has pitched 29 straight outings without allowing more than four runs — the second-longest such streak in the majors. To fully grasp the magnitude of Aaron Nola's performance, it is helpful to think back to Sept. 2 of last season. The Phillies were playing out the string in Miami, and the Marlins were knocking Nola around as much as anybody had all season. Giancarlo Stanton and Marcell Ozuna both homered in the first inning, and the Marlins would score six runs before the Phillies went to the bullpen in the sixth. It was a forgettable effort in a forgettable season, but it bears a crucial bit of significance because that outing currently stands as the last time Nola allowed an opponent to score more than four runs against him. That, right there, is where any analysis of Nola's performance this season needs to start. More than his ERA, or his strikeout rate, the beauty of the 25-year-old righthander's current campaign lies in his consistency. Roy Halladay's longest streak of starts allowing four or fewer runs was 18. Cliff Lee's was 16. Steve Carlton's was 26. Nola, meanwhile, has held opponents to four or fewer runs in 29 straight outings, the second-longest active streak in the majors behind Clayton Kershaw and the longest by a Phillies pitcher since Cole Hamels did it in 29 straight games in 2014-15. Aaron Nola’s four-runs-or-less streak is the fourth-best in team history, and the longest since Cole Hamels did it in 2014-15. Over his last 10 starts, Nola has forced his way into the NL Cy Young Award conversation with a run of dominance in which he has held opponents to just 65 baserunners and 13 runs in 65 2/3 innings. At this point, it is difficult to make the case that he deserves the award over the Nationals' Max Scherzer or the Mets' Jacob deGrom, both of whom have logged more innings with lower ERAs and better strikeout and walk numbers. Even those who cling to the antiquated notion that deGrom's paltry win total (he's 8-7) should disqualify him from contention would be hard-pressed to reward Nola's 14-3 mark over Scherzer's 16-5. But limiting our focus to the Cy Young debate would threaten to understate the extent of Nola's dominance. A more appropriate conversation might be to put his 2018 campaign in the context of Phillies history. Once we start to look at it through that prism, it isn't long before we arrive at the realization that we are witnessing one of the best seasons by a starting pitcher in club history. Few will dispute that Steve Carlton's 1972 campaign should be held as the gold standard by which all great seasons are measured. That year, the 27-year-old lefty recorded an average of 25 outs per start, pitching a total of 346 1/3 innings while going the distance in 30 of 41 games. The sheer volume of work that he logged while posting a 1.97 ERA and 310 strikeouts puts his accomplishment out of the reach of any pitcher in today's game. Yet on a per-batter basis, Nola's production in 25 starts this season has been just as impressive as Carlton's in '72, and perhaps even more so. Consider the metric ERA+, which measures a pitcher's ERA as a factor of the league average ERA for that season and then adjusts it according to the player's ballpark. Nola's 188 ERA+ would be the highest-ever single-season mark for a Phillies starter with at least 160 innings (since integration in 1947). In 1972, Carlton's ERA+ was 182. Nola has struck out a higher percentage of the batters he has faced in 2018 than Carlton did in 1972. In fact, his strikeout rate of 25.4 percent would be the fifth-best single-season mark by a Phillies starter in the integration era. Going by Baseball-Reference.com's Wins Above Replacement metric, Nola's 2018 season is already the 10th-best in Phillies post-integration history. With an 8.2 WAR in 25 starts, Nola is on pace to finish with 10.8 WAR in 33 starts, a mark that would stand second only to Carlton's 12.1 in 1972. There are arguments to be made for other seasons. Roy Halladay averaged an inning more per start in 2010 and 2011, as did Cliff Lee in 2011. Carlton's 1980 campaign was almost as impressive as the one he had produced eight years earlier. However you prioritize the numbers, it is clear that Nola's 2018 is on track to rank among the very best seasons that this franchise has ever seen. And if you factor his age into the equation, the numbers are even more remarkable. If Nola finishes the season with 10.8 WAR, it would rank as the second-highest since integration of any pitcher under the age of 26, with only Dwight Gooden's 12.2 in 1985 ranking higher. Long story short: Even if Nola isn't this year's NL Cy Young winner, he is keeping some pretty good company.